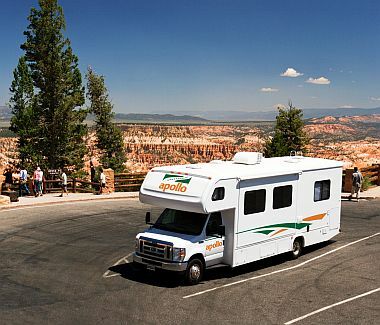 Have motorhome, will travel – that’s the motto of people who have discovered the enchantment of exploring America in an RV, or recreational vehicle, as motorhomes are otherwise known as. Taking your home with you on the road gives you the freedom to venture out into areas off the well-trodden track, in luxury motorhomes that can sleep a whole family. You can rent a motorhome from 21 years old and vehicles are all equipped with the latest in mod cons and creature comforts. They are easy to drive too. Convenience kits, typically included in the rental prices, include bedding, linen, cooking dishes and cutlery, so you can head for the wide-open spaces in as little as an hour from when you arrive to pick the vehicle up. If you would like a price for a motorhome please send us a wishlist request from the Motorhome holiday to America itinerary. You can get a price, check availability and book online for El Monte RV only by heading to our EL MONTE RV ONLINE BOOKING page. Suitable for familes & couples who really want space. With so much room, with so much comfort, the Larger Motorhome is an exceptional choice for friends, families and lovers of space. They have everything you could ask for in an RV and sleep up to four adults and two children comfortably. El Monte RV - AS32 (31' to 33') - sleeps 4 adults or 2 adults and 2 children. CS30 (29' to 31') - sleeps 4-5 adults or 2 adults and 4 children. C28 (27' to 29') - sleeps 4 adults or 2 adults and 3 children. 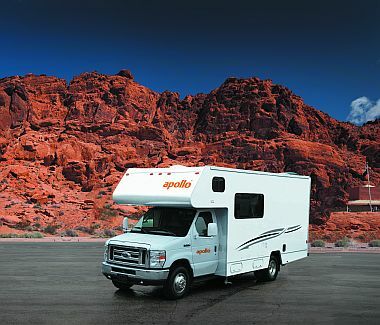 Apollo - Elite Traveller (31') - sleeps up to 5 adults. US Wanderer (31') - sleeps up to 4 adults and 2 children. Eclipse Camper (27' to 30') - sleeps 2 adults and up to 3 children. Suitable for younger familes and couples. The medium size Motorhome is a popular choice for those who are travelling with friends or family. Like the larger motorhomes, they sleep up to four adults and two children. They provide all the features in a slightly more compact design. El Monte RV - C25 (24' to 26') - sleeps 4 adults or 2 adults and 3 children. C22 (22' to 24') - sleeps 3 adults or 2 adults and 2 children. Apollo - Sunrise Escape (25') - sleeps 2 adults and up to 3 children. Pioneer (22' to 25') - sleeps up to 4 adults and 1 child.